The internet is an essential employment resource for many of today’s job seekers, according to a new survey by Pew Research Center. A majority of U.S. adults (54%) have gone online to look for job information, 45% have applied for a job online, and job-seeking Americans are just as likely to have turned to the internet during their most recent employment search as to their personal or professional networks. Yet even as the internet has taken on a central role in how people find and apply for work, a minority of Americans would find it difficult to engage in many digital job seeking behaviors – such as creating a professional resume, searching job listings online, or following up via email with potential employers. And while many of today’s job seekers are enlisting their smartphones to browse jobs or communicate with potential employers, others are using their mobile devices for far more complex and challenging tasks, from writing a resume to filling out an online job application. Online employment resources now rival personal and professional networks as a top source of job information for Americans who are looking for work. Roughly one-third of Americans have looked for a new job in the last two years, and 79% of these job seekers utilized online resources in their most recent search for employment. That is higher than the proportion who made use of close personal connections (66%) or professional contacts (63%) and more than twice the proportion who utilized employment agencies, print advertisements, or jobs fairs and other events. Taken together, 80% of recent job seekers made use of professional contacts, close friends or family, and/or more distant personal connections in their most recent search for employment – nearly identical to the 79% who utilized resources and information they found online. 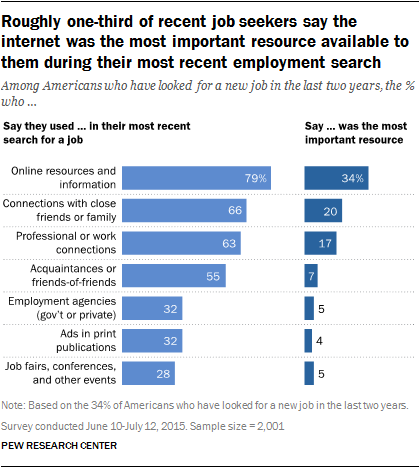 Indeed, 34% of these job seekers say resources and information they found online were the most important resource available to them in their most recent job search, which places the internet just behind personal and professional networks of all types on the list of Americans’ most important job resources. In total, 45% of recent job seekers indicate that personal or professional contacts of any kind were the most important resource they utilized in their last search for employment: 20% cite close personal connections as their most important source of assistance, 17% cite professional or work contacts, and 7% cite more distant personal acquaintances. 94% of smartphone job seekers (representing 26% of all American adults) have used their smartphone to browse or research job listings. 87% (representing 24% of all adults) have called a potential employer on the phone using their smartphone. 74% (representing 20% of all adults) have used their smartphone to email someone about a job they were applying for. 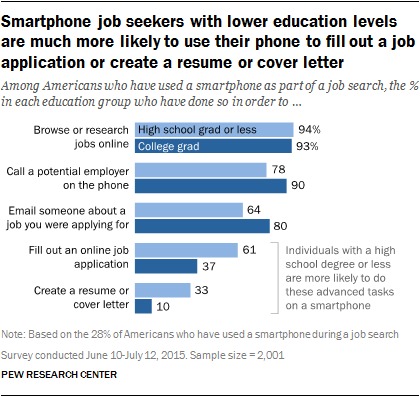 Overall, 47% of smartphone job seekers say their phone is “very important” in helping them look for job and career resources, and an additional 37% describe it as “somewhat important.” But despite the overall significance of smartphones to these users, many of them have encountered challenges navigating the job search process on a mobile device. 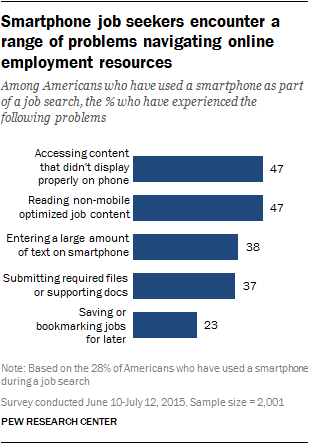 Nearly half of smartphone job seekers have had problems accessing job-related content because it wasn’t displaying properly on their phone or had difficulty reading the text in a job posting because it was not designed for a mobile device. And more than one-in-three have had trouble entering a large amount of text needed for a job application or had difficulty submitting the files or other supporting documents needed to apply for a job. Despite the importance of digital resources when it comes to looking for work today, a minority of Americans would find it difficult to engage in a variety of digital job-seeking behaviors. Building a professional resume is among the most prominent of these challenges: Some 17% of Americans (not including those who are retired and/or disabled) indicate that it would not be easy to create a professional resume if they needed to do so. Another 21% say that it would not be easy to highlight their employment skills using a personal website or social media profile. Roughly one-in-ten indicate that it would be difficult for them to go online to find lists of available jobs (12%); fill out a job application online (12%); use email to contact or follow up with a potential employer (11%); or look up online services available to assist job seekers (10%). In many cases, Americans who might benefit the most from being able to perform these behaviors effectively – such as those with relatively low levels of educational attainment – are the ones who find them most challenging. For instance, 30% of those with a high school diploma or less would have trouble creating a professional resume (compared with just 6% of college graduates), as would 28% of those who are currently not employed (double the 14% of employed Americans who would find it difficult to do this). Nearly two-thirds of Americans now use social media platforms of some kind, and a substantial number of social media users are utilizing these platforms to look for work – and also to pass along employment tips to their own friend networks. Some 35% of social media users have utilized social media to look for or research jobs, while 21% have applied for a job they first found out about through social media, and 34% have used social media to inform their friends about available jobs at their own place of employment. In addition, 13% of social media users say information that they have posted on social media has helped them get a job. 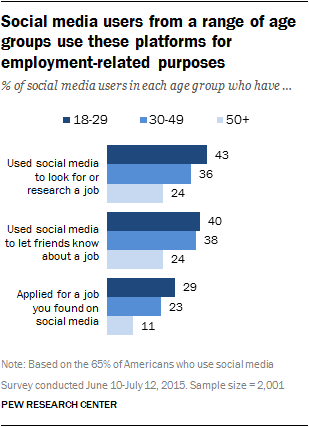 Younger users are especially active at utilizing these platforms for employment-related purposes, but many older users are taking advantage of social media when looking for work as well. Roughly one-quarter of social media users ages 50 and older have used these platforms to look for work or to let their friends know about job openings, and 11% of older social media users have applied for a job they first found out about on social media.